Growths or tumors can occur anywhere in the body, and the mouth is no exception. To diagnose what exactly the growth is, dental x-rays and a biopsy are most often recommended. Depending on the type of tumor and age of the patient, additional diagnostics that may be recommended including blood work, urinalysis, chest radiographs, and/or abdominal ultrasound. A lymph node aspirate or biopsy may also be recommended. It is important to diagnose tumors as early as possible. Frequent inspection of the mouth at home is the best way to monitor for oral growths. Monitoring for oral growths can easily be paired with daily tooth brushing. Below are descriptions of the most commonly seen oral tumors. They are classified into benign and malignant tumors. Benign tumors do not usually metastasize or spread to distant organs like the liver, lung, or brain. Although they may not spread to other organs in the body, some of the tumors can invade into the surrounding local tissues and contribute to secondary problems like swelling, pain, adjacent tooth death, extension into the nose or eye, or even jaw fractures. “Epulis” refers to any tumor or growth of the gingiva (i.e. gum tissue). In fact, an epulis can be a non-cancerous growth that occurs as a result of chronic irritation. Historically, three main types of are described in dogs: fibromatous, ossifying, and acanthomatous.Treatment depends on the exact kind of growth so it is very important that any epulis is biopsied. Odontogenic tumors and cysts are oral growths that develop from dental tissues. They are not considered malignant and they do not usually metastasize or spread to distant organs like the lung or brain. Some of the tumors can be very aggressive locally, and some like to invade into bone and surrounding teeth. Cheek chewers granuloma is non-cancerous tissue swelling caused by self-inflicted trauma when chewing. The thickened areas are usually located at the inner cheek lining or the underside of the tongue edges. The condition is seen most often in small dogs with a tendency to bark; however, the lesions can be found in other types of canines or cats. Therapy is directed at surgically debulking the tissue to prevent further trauma. Tissue should be biopsied to rule out other tumors including eosinophilic granuloma, a great mimicker of cheek chewers lesions. Malignant tumors have the potential to metastasize or spread to distant organs like the liver, lung, or brain. Some of the tumors can also invade into the surrounding local tissues and contribute to secondary problems like swelling, pain, adjacent tooth death, extension into the nose or eye, or pathologic jaw fractures. Malignant melanoma(MM) is the most common malignant oral tumor seen in the dog. The tumor may appear as pigmented or non-pigmented. Unfortunately, MM often metastasizes to other parts of the body like the lungs, lymph nodes, or bone. Aggressive surgery can increase survival time and is aimed at removing as much of the tumor as possible. In addition, radiation therapy and chemotherapy can also increase survival time. A melanoma vaccine is also available which may improve prognosis. Squamous cell carcinoma(SCC) is the second most common malignant oral tumor in the dog. SCC can metastasize to other parts of the body. The prognosis is more favorable for tumors located toward the front of the mouth. Metastasis is more common when tumors are located toward the back of the tongue or tonsils. Early aggressive surgical excision is the treatment of choice. Early recognition and intervention is important. Radiation therapy can also be considered in treatment planning. 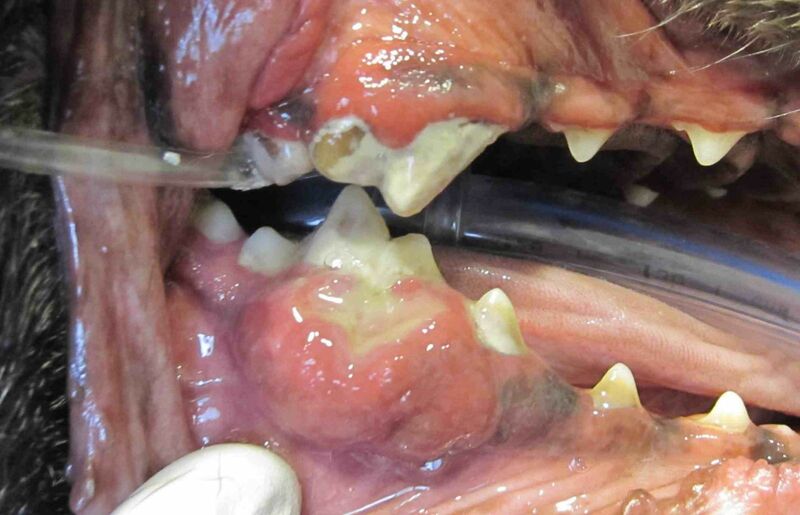 Fibrosarcoma(FSA) is the third most common malignant oral tumor in the dog. The tumor can metastasize to other parts of the body. FSA can grow large and invade into the nasal cavity. Treatment involves surgical removal of the tumor. FSA is poorly responsive to radiation therapy and chemotherapy. Complications are related most often to local recurrence and invasion rather than spread to other organs. For more information on cancer in the canine, please visit the Veterinary Society of Surgical Oncology site.